What went on in April, 2016? What went on in March, 2016? What went on in February, 2016? What went on in January, 2016? Much of my news comes from The Daily Climate, whose wonderful subscription service clues me in to what's going on each day. Another great source of stories (and commentaries) comes from my friend Jim Poyser, at Apocadocs. Why Scientists Are Amazed at Oilsands Smog Levels: … air pollution from the oilsands, measured by airplanes, is now "comparable to downwind of megacities such as Mexico City and Paris, and is higher than that observed in Tokyo and New England." In fact the tarsands, already the largest source of climate disrupting greenhouse gas emissions in Canada, have a new grim moniker: "one of the largest sources of anthropogenic secondary organic aerosols in North America." Researchers define "secondary organic aerosols" or SOAs as gases and particles that interact with sunlight in complex ways and that are released by both the globe's plant matter as well as fossil-burning machines and industries. That mining the oilsands would create smog isn't news to researchers — but the kind of air pollution identified and the sheer magnitude of it is what startles, and concerns, the scientific community. The vapours react with sunlight and form particles in the air. "They are larger molecules than the hydrocarbons that would be emitted from a city. These vapours react in the atmosphere to form secondary organic aeorsols, which is part of smog." SOAS have been linked to a variety of bad health impacts including respiratory and cardiovascular diseases. CSIRO dismantles 'integrated' climate science group as pressure mounts on Larry Marshall: CSIRO's deep cuts to its science programs have come under fresh criticism with the head of a global network of monitoring stations warning Australia will lose key researchers that will dent the country's ability to manage future climate change. Almost all the staff at CSIRO's Yarralumla, ACT site researching how vegetation is responding to rising temperatures and shifting rainfall patterns – information that feeds into the world's main climate models – have been told their jobs are "surplus to needs", senior scientists say. 'Delusional': NSW report banks on rising coal output and royalties out to 2056: The Baird government's future projection for NSW implies the state will extract more than 10 billion tonnes of coal at the rate of almost 1 million tonnes a day by 2056, forecasts the Greens say are "delusional" in a carbon-constrained world. The NSW Intergenerational report released this month estimated Australia's richest state would swell in population by 50 per cent to 11.2 million in 40 years, with an annual output of $1.3 trillion by then. Air and water problems are worsening on a global scale, U.N. says: In a sweeping synthesis of global data, the United Nations Environment Programme has intensively catalogued environmental assaults across the six different major regions of the globe. And it finds that, overall, damage to the planet is happening more rapidly than before, through slights ranging from air pollution, to the proliferation of human and toxic waste, to water scarcity and climate change. ExxonMobil moved to squash a well-established congressional lecture series on climate science just nine days after the presidential inauguration of George W Bush, a former oil executive, the Guardian has learned. Indeed, the company moved swiftly during the earliest days of the Bush administration to block public debate on global warming and delay domestic and international regulations to cut greenhouse gas emissions, according to former officials of the US Global Change Research Program, or USGCRP. Rising Seas Push Too Much Salt Into The Florida Everglades: Because of climate change and sea level rise, the ocean is starting to seep into the swampland. If the invasion grows worse, it could drastically change the Everglades, and a way of life for millions of residents in South Florida. Writing in the Huffington Post, Bigelow also pointed to another text used for 'almost all' Portland high school students, Holt McDougal's Modern World History, which he said 'includes a scant three paragraphs on climate change, the second of which begins: "Not all scientists agree with the theory of the greenhouse effect." In February, a survey of 1,500 science teachers in the US published in the journal Science found that 30% were teaching students that climate change was 'likely due to natural causes" and not caused by human activities, despite the consensus of 97% of active climate scientists. Crocodiles and Palm Trees in the Arctic? New Report Suggests Yes. : If we keep burning fossil fuels, Earth will be 8 degrees warmer, returning to the climate of 52 million years ago, according to new research. It's the most dire prediction yet. Global temperatures will increase on average by 8 degrees Celsius (14.4 degrees F) over preindustrial levels by 2300 if all of Earth’s fossil fuel resources are burned, adding five trillion metric tons of carbon to the atmosphere, according to the research by Canadian scientists published in Nature Climate Change. In the Arctic, average temperatures would rise by 17 degrees C (30.6 degrees F). At 9news, the 400ppm was described as a “tipping point”. One bulletin from climate campaign group 350.org said the 400ppm figure was a “red line of pollution that, now breached, locks in more tragic climate impacts”. Well, it’s neither a “tipping point” or a “red line” but the inexorable rise of these numbers over decades is just as fundamental. Nothing in particular happens to the Earth’s climate at 400ppm as opposed to, say, 399 or 401, but given the human condition for celebrating milestones (even ones we really don’t like) the attention it got was understandable and warranted. Professor Michael Mann of Penn State University in the US says there is no evidence in the ancient climate record “for the rapidity of the current human-caused release of CO2”. A 2009 study in the journal Science found the last time in Earth’s history when CO2 levels in the atmosphere were this high for a sustained period was between 15 and 20 million years ago. The Fort McMurray fire’s stunning pulse of carbon to the atmosphere: Taylor’s colleague, Werner Kurz, is a senior research scientist at the Canadian Forest Service and heads its carbon accounting team. He said he generally estimates that for every hectare of forest land consumed in a fire like this one, about 170 tons of carbon-dioxide-equivalent emissions — so dubbed because they actually include not only carbon dioxide but also methane and nitrous oxide, two other greenhouse gases — head into the atmosphere. That would mean that this single fire has contributed — for a rough estimate — some 85 million tons of carbon-dioxide-equivalent emissions. A Warming World Means Less Water, With Economic Consequences: High and Dry: Climate Change, Water, and the Economy examines the future effects of diminishing water supplies on the world. "Water-related climate risks cascade through food, energy, urban, and environmental systems," researchers write. "Growing populations, rising incomes, and expanding cities will converge upon a world where the demand for water rises exponentially, while supply becomes more erratic and uncertain." The day coal power dropped out of the national grid for the first time in more than 100 years: 1882 until 10 May this year, coal has powered the nation. Could the UK be one of the first countries to end coal power altogether? Voice of the Southern: A future without coal? : On Saturday, the Old King Coal Festival hosted a rally of the “Coal Miners Movement” at its main stage. The newly formed advocacy group, whose slogan is “Make coal great again,” seeks to support laid off coal miners. Make coal great again. We wonder where they came up with that motto? Southern Illinoisans are wounded by the decline of the coal industry. We understand. But there is a finite amount of coal. No one disputes this. At some point, coal jobs in Southern Illinois will go away entirely. Your legislator cannot — or will not — admit that. When the mosquitoes will be biting in your state: Mosquitoes may be the absolute worst organism inhabiting Earth today. Setting aside the garden-variety aggravation of billions of mosquito bites each year, the bugs are vectors of horrible diseases that kill literally hundreds of thousands of people annually. We’ve all become acutely aware of this latter point with the sudden rise of the Zika virus, which is linked to birth defects and is now inching its way north through the Americas on the backs of several mosquito species. Given that it’s now late May and what is colloquially known as “mosquito season” is underway, concern over the virus and the bugs that carry it is mounting. The Politics of Teaching Climate Science: Climate activists see bringing climate change into the classroom as a simple matter of updating the science curriculum. But a recent survey revealed that science teachers are often ill-equipped to deal with the subject. The scale of the crisis unfolding in 10 or more southern African countries has shocked the United Nations. Lulled into thinking that Ethiopia in 1985 was the last of the large-scale famines affecting many millions, donor countries have been slow to pledge funds or support. More than $650m and 7.9m tonnes of food are needed immediately, says the UN. By Christmas, the situation will have become severe. Malawi, Mozambique, Lesotho, Zimbabwe, Namibia, Madagascar, Angola and Swaziland have already declared national emergencies or disasters, as have seven of South Africa’s nine provinces. Other countries, including Botswana and the Democratic Republic of the Congo, have also been badly hit. President Robert Mugabe has appealed for $1.5bn to buy food for Zimbabwe and Malawi is expected to declare that more than 8 million people, or half the country, will need food aid by November. "This isn't a model. These are precise and accurate measurements, and they tell us about how humans are changing the balance of heat in the Earth system," said Jim Butler, director of NOAA's Global Monitoring Division, in a statement. "We're dialing up Earth's thermostat in a way that will lock more heat into the ocean and atmosphere for thousands of years." To meaningfully tackle global warming means tracking the emissions and rising concentrations of greenhouse gases to their sources. The best hope of doing that is via the satellites of NASA's OCO-2 orbiting carbon observatory, Trenberth said. Readings from sensitive instruments, combined with computer models, will help pinpoint where the heat-trapping pollution originates, and also identify which parts of Earth are helping remove carbon from the atmosphere. Degradation of the world’s natural resources by humans is rapidly outpacing the planet’s ability to absorb the damage, meaning the rate of deterioration is increasing globally, the most comprehensive environmental study ever undertaken by the UN has found. The study, which involved 1,203 scientists, hundreds of scientific institutions and more than 160 governments brought together by the UN Environment Programme (UNEP), concludes that without radical action the level of prosperity that millions of people in the developed world count on will be impossible to maintain or extend to poorer countries. Canada regulatory board greenlights Trans Mountain pipeline: But Kinder Morgan would have to address 157 environmental, safety and financial conditions, including holding $1.1 billion in liability coverage and detailing its plans to protect endangered species. The board said the project is the first to be required to detail plans for offsetting emissions. Michael Mann, climate scientist, Penn State University: Ten years later, the movie is as relevant today as it was back then, and if anything, even more so, given that many of the more detrimental changes, like the melting of ice across our planet, have proceeded even faster than predicted. I still screen the movie for my first-year seminar students, and they find it every bit as engaging and informative now as when I first began showing it a decade ago. Climate change, runaway development worsen Houston floods: Now the nation's fourth-largest city is being overwhelmed with more frequent and more destructive floods. The latest calamity occurred April 18, killing eight people and causing tens of millions of dollars in damage. The worsening floods aren't simple acts of nature or just costly local concerns. Federal taxpayers get soaked too. Extreme downpours have doubled in frequency over the past three decades, climatologists say, in part because of global warming. The other main culprit is unrestrained development in the only major U.S. city without zoning rules. That combination means more pavement and deeper floodwaters. Critics blame cozy relations between developers and local leaders for inadequate flood-protection measures. Metro Houston, which includes smaller communities and unincorporated parts of Harris County, has added more than a million people since 1992, while the amount of water-absorbing wetlands per capita has been halved. Paved surfaces in the county increased by well over 25 percent in that period, according to researchers. Paved land generates five times more runoff than woodlands. A Boon for Soil, and for the Environment: a growing number of experts, environmentalists and farmers themselves see their fields as a powerful weapon in the fight to slow climate change, their very soil a potentially vast repository for the carbon that is warming the atmosphere. Critically for an industry that must produce an ever-larger bounty to feed a growing global population, restoring lost carbon to the soil also increases its ability to support crops and withstand drought. To bring levels back up, a set of techniques known as carbon farming, or regenerative farming, encourage and complement the process by which plants draw carbon dioxide from the atmosphere, break it down and sequester carbon into soil. They include refraining from tilling, or turning, the soil; mixing crops together rather than growing large fields of just one type; planting trees and shrubs near or among crops; and leaving stalks and other cuttings on fields to decay. 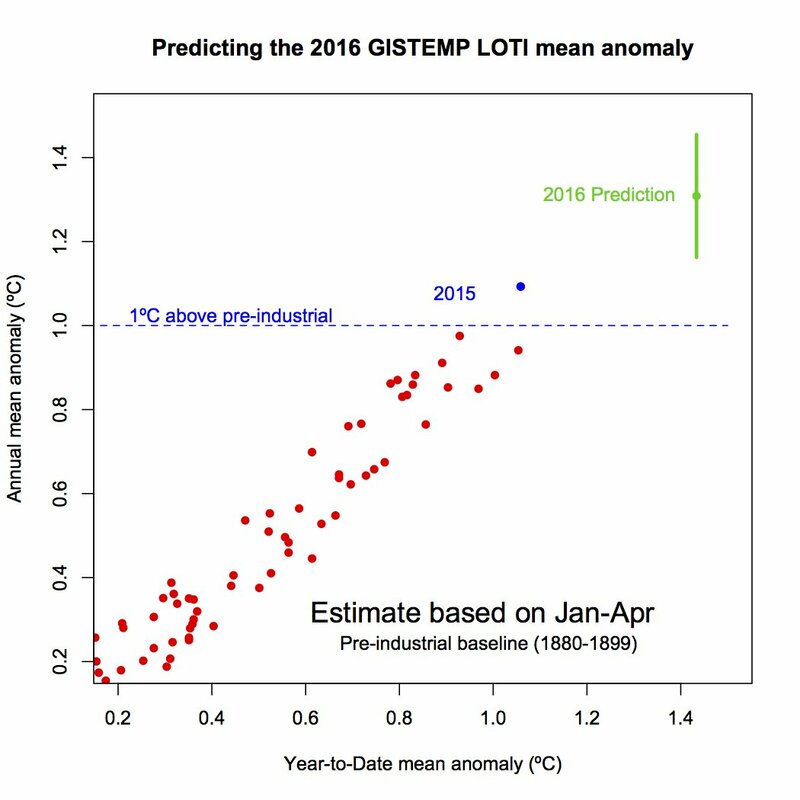 Given the head start this year has over last, there is a more than 99 percent chance that 2016 will best 2015 as the hottest year on the books, according to Gavin Schmidt, head of NASA’s Goddard Institute for Space Studies, which keeps the agency’s temperature data. Why even the people who worry the most about climate change often take little action: [Kathryn Doherty] and co-author Thomas Webler, also of SERI, concluded that a person’s sense of how active people around them are being about climate change — as well as how effective they think their own actions are — are some of the most important drivers. In other words, people may be alarmed, but they could also be isolated or feeling despair — and if they don’t think they have the power to do anything, or aren’t in a social network that empowers them, then they simply won’t do something. It turns out the biggest predictor for climate action involved — that’s right — other people. Significantly more people in the active group reported that their friends and family members were willing to take part in public-sphere climate action. On the other hand, more people in the less active group reported that people who weren’t close to them — groups described as “most Americans,” for instance — were willing to engage in these kinds of actions, but not anyone they actually knew. Governments seek rules for Paris climate deal; temperatures soar: Governments began work on Monday on a rule book to implement the 2015 Paris Agreement to limit global warming, with the United Nations urging stronger action after a string of record-smashing monthly temperatures. NASA said at the weekend that last month was the warmest April in statistics dating back to the 19th century, the seventh month in a row to break temperature records. Ontario to spend $7-billion on sweeping climate change plan: Ontario will begin phasing out natural gas for heating, provide incentives to retrofit buildings and give rebates to drivers who buy electric vehicles. It will also require that gasoline sold in the province contain less carbon, bring in building code rules requiring all new homes by 2030 to be heated with electricity or geothermal systems, and set a target for 12 per cent of all new vehicle sales to be electric by 2025. Exxon scrambles to contain climate crusade: A green campaign to make the company pay for climate change is besieging the oil industry and its conservative allies. Global sea-level expert John Church made to walk the plank by CSIRO: For John Church, a leading authority on sea-level rise caused by global warming, there was much that was fitting – and yet callous – about being sacked at sea. The long-suffering Florida coral reef tract — the largest reef in the continental U.S. and third-largest barrier reef ecosystem in the world — may have bigger problems than anyone thought, according to new research from the University of Miami and Florida International University. Scientists have discovered that part of the reef is actually dissolving into the water, likely thanks to the effects of human-induced ocean acidification. They found that the reef was dissolving, at least during some parts of the year (generally the fall and winter), in various places throughout the Keys. In the spring and summer, some areas to the south were able to make up for these losses — but, worryingly, the researchers found that the part of the reef in the northern Keys, closer to Miami, was already eroding more quickly than the corals were able to rebuild themselves. The culprit appears to be ocean acidification, a chemical process that happens when carbon dioxide dissolves in the water and undergoes a reaction that lowers the ocean’s pH. When this happens, several consequences can occur, according to the new study’s lead author, Chris Langdon, chair of the University of Miami’s department of marine biology and ecology. The results are especially worrisome, given that the northern part of the reef appears to have hit a tipping point in which more limestone is being lost than rebuilt. While it’s well established that acidification is bad for coral, previous research had suggested that reefs around the world likely wouldn’t hit this net erosion threshold until closer to mid-century, when carbon dioxide levels were higher. Global Warming Cited as Wildfires Increase in Fragile Boreal Forest: Scientists say the near-destruction of Fort McMurray last week by a wildfire is the latest indication that the vital boreal forest is at risk from climate change. Army Corps rejects permit for coal terminal at Cherry Point: The proposed coal terminal for Cherry Point is likely dead after the U.S. Army Corps of Engineers denied a needed permit Monday, May 9. The Corps ruled the project would impact the treaty-protected fishing rights of Lummi Nation based on the fact that the proposed trestle and associated wharf would take up 122 acres over water. Big Oil Abandons $2.5 Billion in U.S. Arctic Drilling Rights: After plunking down more than $2.5 billion for drilling rights in U.S. Arctic waters, Royal Dutch Shell Plc, ConocoPhillips and other companies have quietly relinquished claims they once hoped would net the next big oil discovery. The pullout comes as crude oil prices have plummeted to less than half their June 2014 levels, forcing oil companies to cut spending. For Shell and ConocoPhillips, the decision to abandon Arctic acreage was formalized just before a May 1 due date to pay the U.S. government millions of dollars in rent to keep holdings in the Chukchi Sea north of Alaska. This is how serious India's drought has gotten: As many as one-quarter of the country — 330 million people — could be affected by the shortages, the government has said. A weeks-long summer heat wave has left an estimated 370 dead ahead of the annual monsoon rains that usually bring some respite from the dry conditions. Keeping My Fossil Fuel in the Ground: I hadn’t planned on leasing these lands when I attended an auction run by the federal Bureau of Land Management, a government agency that manages hundreds of millions of acres of public land across the West. I was there to protest the leasing of these lands to oil and gas companies planning to drill for fossil fuels. Mobil's Chief Executive Warned of CO2 From Oil Sands Fuels in 1982: Concerned that carbon-heavy fuels would speed up global warming, the CEO put his trust in the United Nations and federal scientists to point the way to solutions. "The switch to heavier fossil fuels has already caused much popular concern, primarily seen in some nations' fear of the effects of acid rain," he wrote, "and the general fear that excessive use of these fuels may so build up carbon dioxide in the atmosphere that the earth's temperature may increase, with some disastrous consequences. "Both of these fears should be seriously addressed." His advice was not heeded. Development of the oil sands continued in subsequent decades and boomed after the turn of the century. Cutting to the core: CSIRO to end long-standing Antarctic ice, air research: CSIRO plans to close its ice lab and cease key Antarctic science activities, moves that scientists warn will damage Australia's international partnerships and run counter to a new $2 billion-plus government plan for the region. The Last Time CO2 Was This High, Humans Didn’t Exist: The last time there was this much carbon dioxide (CO2) in the Earth's atmosphere, modern humans didn't exist. Megatoothed sharks prowled the oceans, the world's seas were up to 100 feet higher than they are today, and the global average surface temperature was up to 11°F warmer than it is now. As we near the record for the highest CO2 concentration in human history — 400 parts per million — climate scientists worry about where we were then, and where we're rapidly headed now. Abrupt Sea Level Rise Looms As Increasingly Realistic Threat: Ninety-nine percent of the planet's freshwater ice is locked up in the Antarctic and Greenland ice caps. Now, a growing number of studies are raising the possibility that as those ice sheets melt, sea levels could rise by six feet this century, and far higher in the next, flooding many of the world's populated coastal areas. U.S. coal use is down in nearly every state: On Thursday, the Energy Information Administration added a new brushstroke to the portrait of King Coal in decline. In every state that doesn’t end in “-aska,” coal consumption in the electric power sector dropped between 2007 and 2015. Overall, the United States saw a 29-percent decline in coal use for electricity generation over this time period. "We had to check that our models were still working properly" Peter Langen, a climate scientist at DMI, told Polar Portal earlier this month.